So there is some anticipation as we wait outside the college gym where he is presenting this year’s piece. Four Seasons Restaurant begins in utter darkness, a slow swell of sound filling the theater. It’s the sound of a black hole discovered by NASA in the Perseus galaxy 250 million light years away, shifted to a frequency audible to human ears. The sound, like a black-hole, is irresistible. It fills the space and every cell of your body. The audience is provided earplugs with their programs, but this sound doesn’t affect just your ears–there is an adrenaline rush from being in the presence of it, and it is more sensation than it is sound. The piece is structured through a series of associative movements and the conceit of the black hole, which opened the piece, will recur again and again: Images appear and then vanished w, systems of symbols are built and then swept away leaving nothing behind. One of these movements is a play-within-the-play, a staging of Holderlin’s dramatic poem The Death of Empedocles. (Empedocles is the Greek philosopher who threw himself into the mouth of Mount Etna so that people would think he had disappeared and become an immortal god.) It’s another black hole of sorts, another vanishing. In this movement, the curtains open onto a bright white gymnasium with wooden bars on the back wall, a pommel horse, a hoop and a ball, all brown and pristine as the room itself. A girl enters dressed in pinafore and clogs, slowly sticks out her tongue, and then cuts it off with a pair of nail scissors. Nine more girls enter and do the same; ten pieces of tongue falling with a dull thud of limp flesh on the bright white floor. Later, two small dogs, black as shadows in the white room, will enter and eat up the pieces, licking the floor clean. At one point the gym bars are draped with a Confederate flag, and girls hang Kalashnikovs from their shoulders and spray a handgun gold. This might be the American South, it might be the Civil War. Or it might just be a system of symbols, with nothing behind it at all. In another of the movements the curtains close, and instead of opening again on the next scene they recede, sweeping backwards to reveal a cleaned and empty stage. They push forward and back across the stage like a tide, each time leaving in their wake a new image: a girl writhing under a blanket, or a dead horse, or a series of back metal balls of different sizes. In the story of Empedocles, Mount Etna vomits back a sandal, revealing his trick and destroying his claim to immortality. Here, the stage spits back a store of strange and disconnected images, traces of other stories, other lives, other worlds. There is such grandiosity in Castellucci that watching it, I move between awe and utter incredulity. It’s ridiculous at times, and I can’t help but laugh when the curtains sweep back over the body of a giant dead taxidermied horse. It’s completely absurd, out of all proportion. Grace and beauty are delivered in the same phrase as insane excess–dogs eating tongues, death by whipped cream, gold painted guns, and girls giving birth to each other from a mass of bodies. 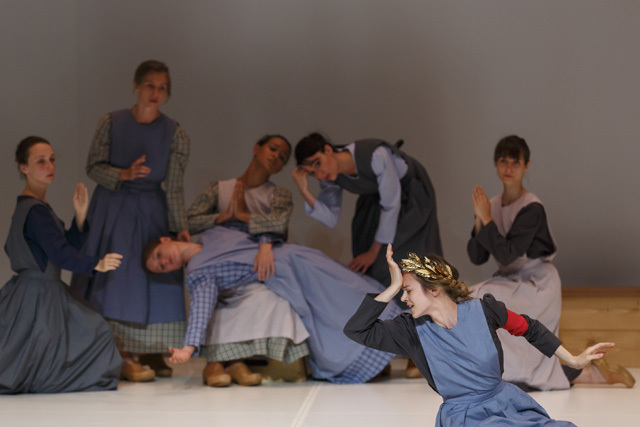 I think it you saw a Castellucci piece with a different score it could read as a farce. I often wonder if he has a sense of humor–for me that horse is a joke, ridiculous and sublime. Or if it’s not a joke then there is something pompous about it, an unearned grandeur that strains the fabric of the piece. But the thing with Castellucci is that he doesn’t direct your responses as most plays do. He makes work without explanation, without irony and without apology, and there you are as an audience member, in the presence of it. His pieces are ruthless and demand that you approach them in a state of wonder. You get out in direct proportion to what you put in.